A lot can change in five months. That's how long it took photographer Candace Berry and her husband David Bryant, a carpenter, to take a neglected and rejected house in the north end and turn it into stunning home that sold before it even went on the market. It started with Bryant's dream of teaming up with his father to flip a house. With a can-do attitude and lots of design ideas, Berry began trolling Viewpoint, seeking out the perfect spot. The seafoam blue house on Rosemeade Avenue wasn't pretty, but there was something about it that hooked her, and she watched it sit on the market for six months. Finally, she buckled and convinced Bryant and her real estate agent it was time to have a closer look. "Some people go into a house and don't see potential, but both Dave and I are the type of people who get really excited and see what it could be right away," says Berry of her first impression. "We walked through and we measured and we visualized everything, like the kitchen could go here, the bathroom could go here." Together with Bryant's parents Al and Anne, the pair put an offer on the house---but not before roughing up a plan---which was accepted, and so began the gut. "We had to take out walls and floors, so the first couple of weeks we were just ripping stuff out," says Berry, who took design control with Bryant's mom, while he and his dad re-imagined and re-configured the house's layout, opening up the downstairs and moving around some space upstairs. In efforts to keep the house's personality while giving it new life, Bryant brought in rescued vintage flooring for the second storey to match the hardwood downstairs and gave its master bathroom a very 1920s makeover. Actually, let's call it a transformation. 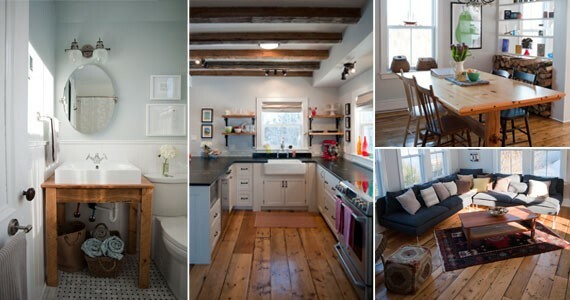 "We knew that the things we were lacking were pantry cupboard space, a front closet and a second bathroom," says Berry. 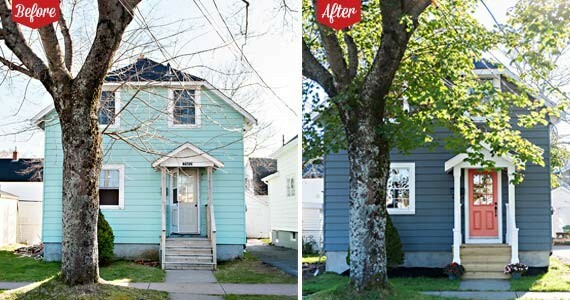 Thinking like potential buyers, Bryant and his dad decided to build a catch-all addition off the kitchen onto the back of the home, making room for laundry and storage that older Halifax homes don't usually allow for. After $80,000 of material and labour, nearly half a year of their lives and some serious family bonding, Berry posted some "after" photos of Rosemeade on her blog to boast about its beauty. The house sold the next day. "There are so many houses in Halifax that are in need of more than just a Band-Aid renovation," says Bryant. "With the right creative approach and skills you can turn a rundown little house into a home with unique character."